As we just discussed, Coenzyme Q10 is a fantastic compound with lots of beneficial effects for both mind and body. That being said, CoQ10 benefits can only be realized if the CoQ10 is being properly absorbed and shuttled to where it is needed. This is where the poor water solubility of CoQ10 starts to become a major limiting factor. For compounds to be absorbed rapidly and efficiently, we want them to have a good ratio between water solubility (hydrophilicity) and water insolubility (hydrophobicity). This ratio is called the Log P, and is a good predictor of bioavailability. The more water soluble a compound is, the better it will get absorbed. However, absorption is also dependent on lipid bilayer permeation in cells. Due to this, you also want a compound to be slightly hydrophobic and lipophilic. The ratio between hydrophobicity and hydrophilicity is the Log P. If the Log P is under 5, then a compound has a good ratio between hydrophobicity and hydrophilicity, and due to this, has the potential to be very bioavailable. In fact, a Log P under 5 is one of the five rules that Christopher A. Lipinski, the medicinal chemist at Pfizer who set the standard for drug bioavailability, established to predict bioavailability of a compound. The Log P of CoQ10 is unfortunately 21, way above the ideal Log P of below 5! It also violates another one of Lipinski’s rule of 5, which stipulates that for ideal bioavailability, a compound should have a molecular weight of below 500 Daltons. CoQ10 has a molecular weight of 863 Daltons. So, unfortunately it doesn’t adhere to this rule either. 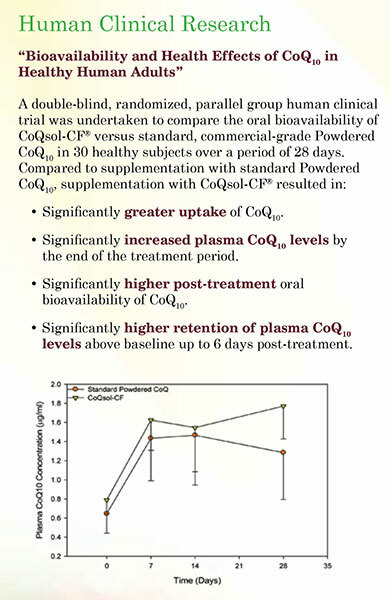 Based on this, plain old crystalline CoQ10 is not a great choice for supplementation, as it has at least two major factors limiting its bioavailability. This is very unfortunate as most CoQ10 supplements on the market are simply crystalline CoQ10 pressed into tablets or loaded into capsules. From the data on absorption mechanisms on CoQ10, it is highly unlikely that we can achieve adequate serum levels of CoQ10 by supplementing with crystalline CoQ10. This means that many regular off-the-shelf CoQ10 products like that ones found in your local grocery store will likely have a hard time truly producing the CoQ10 benefits that people take it for. D-limonene has been shown to produce calming effects, which can help promote healthy levels of stress. D-limonene has been shown to help support our immune function. 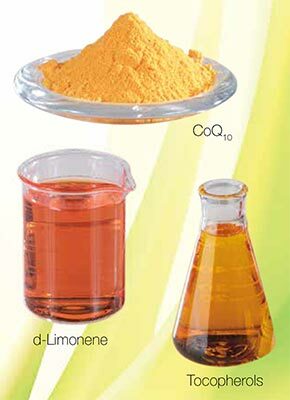 Overall, taking into account the above D-limonene benefits, D-limonene appears to be a very healthy compound! Read on to learn more about what makes CoQsol-CF CoQ10 Softgels the best CoQ10 supplement available..
Vitamin E is one of many antioxidant vitamins, and helps protect from oxidative substances in the body. Vitamin E as been shown to help keep our immune system strong. Vitamin E has been shown help promote healthy cardiovascular function. Vitamin E has been shown to support our brains from excess glutamate. By using mixed tocopherols, the vitamin E content in CoQsol-CF is highly bioavailable. Judging by the vitamin E benefits above, it seems that CoQsol-CF is much more than just a bioavailable CoQ10 supplement, and instead is a fairly comprehensive overall health booster! ATP is the primary source of energy for our cells, and nearly every biological process in our body is dependent on the availability of ATP. You can read more about the importance of ATP in our in-depth creatine blog. Since CoQ10 is such an important component in ATP synthesis, deficiencies in CoQ10 can be majorly detrimental to various different functions within our bodies and brain. By supplementing with CoQ10, especially in the ubiquinone form, we can enhance ATP formation; which should translate to improved physical strength and enhanced cognition. To capitalize on the effects of CoQ10, it may be highly beneficial to take CoQ10 alongside creatine monohydrate. As can be read in the creatine monohydrate blog, creatine is another major regulator of ATP production, and it has been suggested that CoQ10 and creatine synergize to produce large amounts of ATP. Another good product to combine with CoQ10 is shilajit. Studies have shown that when CoQ10 and shilajit are supplemented together mitochondrial function is improved greater than with either one alone. Shilajit essentially improves the efficiency of the supplemented CoQ10. The combination of shilajit and CoQ10 has been shown to significantly elevate levels of ATP in the body. The reason for this is the fulvic acid and humic acids that are found in shilajit. Fulvic acid makes mitochondrial energy extraction more efficient, where humic acid speeds up the transfer of electrons along the electron transport chain. Put together, these mechanisms combine with the mitochondrial enhancing effects of CoQ10 to provide a very significant improvement to your body's entire energy transfer system. So combining CoQSol-Cf with our Primavie shilajit is a great combination that one should consider for energy and mitochondrial support. As mentioned earlier, many people appear to prefer the fully reduced form of Coenzyme Q10, ubiquinol. Why is this the case? In the body, and especially in mitochondrion, ubiquinol benefits are focused on directly reducing oxidation. This is highly important in mitochondrion as their high activity results in large amounts of oxidative stress. By supplementing with ubiquinol CoQ10, it is possible to directly reduce oxidation in targeted areas such as the mitochondrion. These ubiquinol benefits make it highly attractive to consumers, and for good reason, as these oxidation reducing ubiquinol benefits are very desirable! That being said, you do not necessarily have to directly supplement with ubiquinol in order to utilize ubiquinol's benefits. This is due to the fact that ubiquinone actually turns into ubiquinol as it travels through the electron transport chain. In the electron transport chain, CoQ10 exists in three forms: ubiquinone, semiquinone and ubiquinol. Ubiquinone is the fully oxidized form, and when it picks up a proton, it turns into the partially reduced form, semiquinone. Semiquinone is a highly unstable compound which is quickly further reduced to ubiquinol by picking up another proton. Ubiquinol may then act as an antioxidant in the mitochondria. However, when ubiquinol interacts with an oxidant, it becomes oxidized and loses a proton. This turns ubiquinol back into semiquinone. Semiquinone then also becomes oxidized and now we are back at the fully oxidized form of CoQ10: ubiquinone. This means that by either supplementing with ubiquinone or ubiquinol, you will reap similar benefits. That being said, supplementation of ubiquinone may act more rapidly to produce ATP whereas supplementation with ubiquinol may act more rapidly to control oxidative stress in the mitochondria. 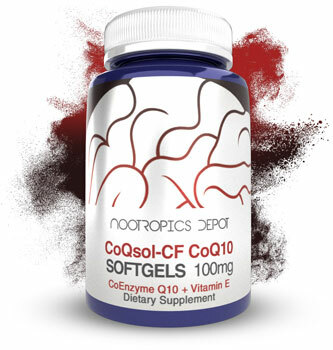 Anybody looking to enhance cellular health via a CoQ10 supplement should consider supplementing with CoQsol-CF. On an anecdotal level, Coenzyme Q10 has helped many of us around the office sustain energy levels, aid in exercise performance, increase mental clarity, and promote mood. On a scientific level, the combination of CoQ10 and creatine monohydrate will produce lots of ATP to keep our cells running at optimal capacity! In particular, if you are interested in supplementing with CoQ10, we would highly recommend CoQsol-CF over most commonly available CoQ10 supplements. Again, as mentioned earlier, this is due to the fact that CoQsol-CF is highly bioavailable in comparison to other CoQ10 supplements on the market. All of the CoQ10 benefits can only be fully realized and implemented if the CoQ10 is actually being absorbed! 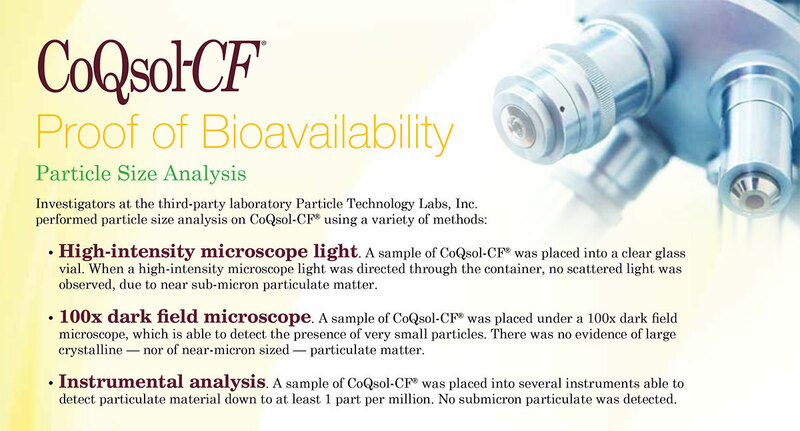 Learn more about the clinical research regarding the biovailability of CoqSol-CF CoQ10 Softgels in the diagram to the left.